So, a LONG time ago I posted on PR that I was going to knock off this Milly Lemon for the RTW contest. Time passes. I bet you'd forgotten all about this unfulfilled project. I haven't, at least not totally. I leave for Paris in less than two weeks and I have nothing to wear! OK, I can't say that with a straight face, but I don't have anything to wear that I've specifically made for Paris and sewing for trips is half the fun of them for me. I bought some red Mirabelle Dansko sandals to go with a (also mythical) planned wardrobe of red, white, and navy and so I figured I'd leverage them into service for Paris, assuming it's warm enough. A big assumption, but I have red boots that can be worn if the weather is cold, even if they will look a little funny with springy clothes. So, I need some red clothes. And this was the first project that sprang to mind. The yoke will be solid red, and the body a red and orange printed (not woven) stylized plaid. Soooo, since I was going to try to get some coordinating clothes ready for Paris, why not do the mini wardrobe contest? The most compelling reason is that I have less than two weeks and have done very little planning for the actual trip part. But, I won't let a little thing deter me. 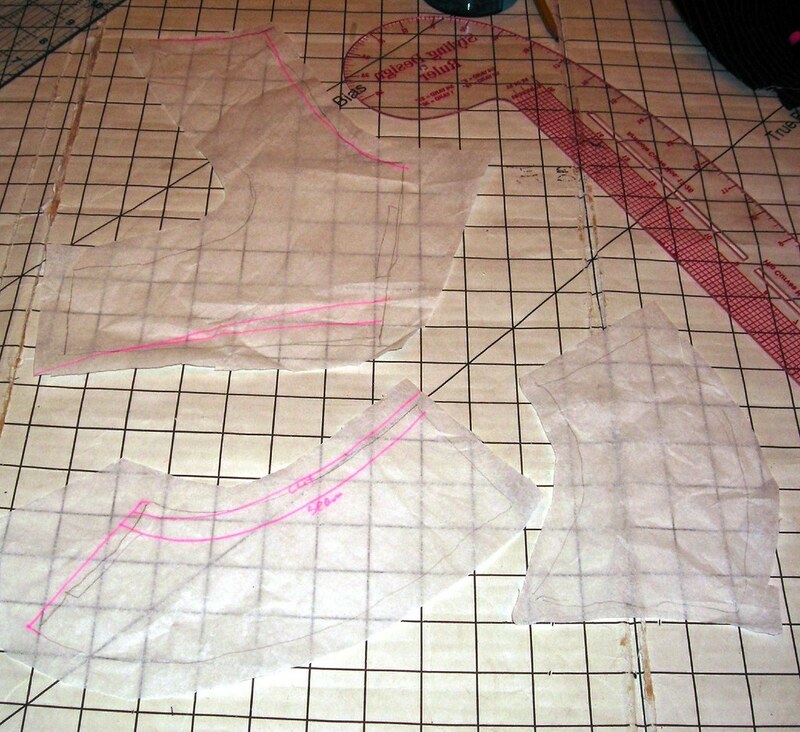 I can't start cutting until May 1, but I can draft my pattern before then, so tonight I started. First, I draped Violet. One of the things I love about this dress is the racerback. My bra straps are forever falling off my shoulders, so I wear racerback bras whenever feasible. For this, I clad her in one of my racerback bras and made sure to draft so the straps would be covered. For the upper front yoke, I used scissors. For the side and back pieces, and I just pinned some fabric to her and drew some markings in chalk. The first muslin was actually pretty great! I am quite excited that I got pretty dang close on the first try. There were a few issues. The front neck was a little too high and narrow, and it was slightly too tight. Well, not even tight, but very close-fitting. I decided to lower and widen the neckline about 3/4 of an inch, and add about 1/2 inch at center front. The back looked great. The lower center back was too low for the style and there was a very slight gape at the upper edge. I decided to alter the pattern by bringing the lower back up about two inches and taking in the inner shoulder seam less than half an inch. 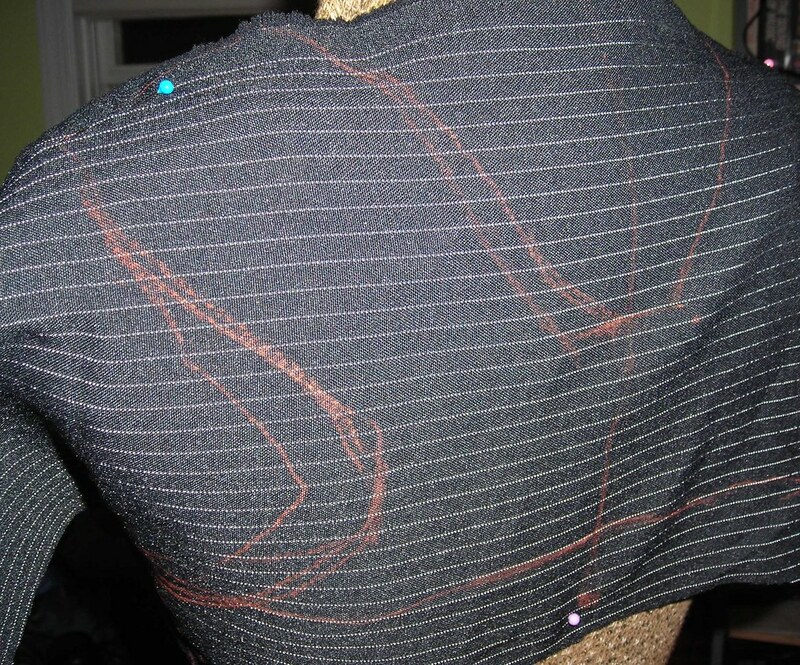 Here's the pattern with alteration marks. And that's enough for one night! I have to go to bed. But I am very pleased with how smoothly it's going. I don't know if I'll make another muslin or not. I might just have faith in my alterations and go forth and sew. The muslin also helped me to figure out how to sew it together. 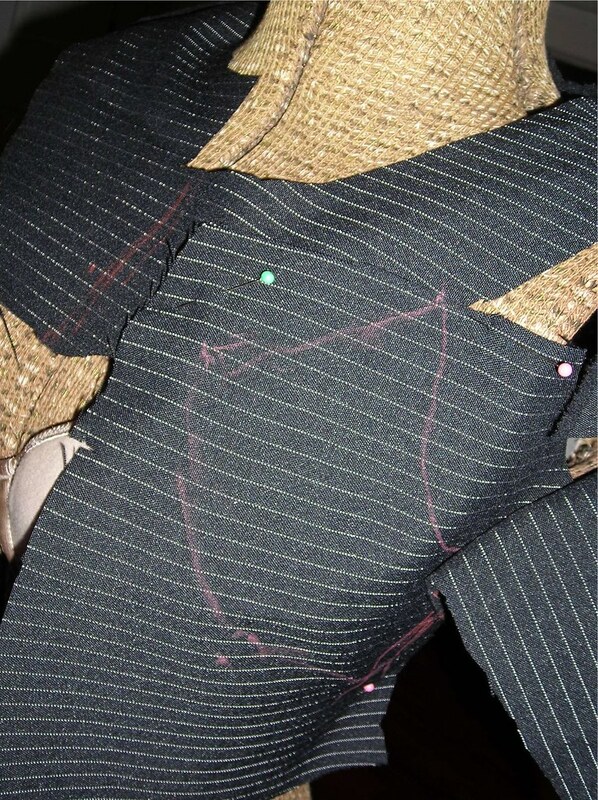 I think the lower side fronts I'll sew to the fronts only between the seam allowances, leaving the SAs free. 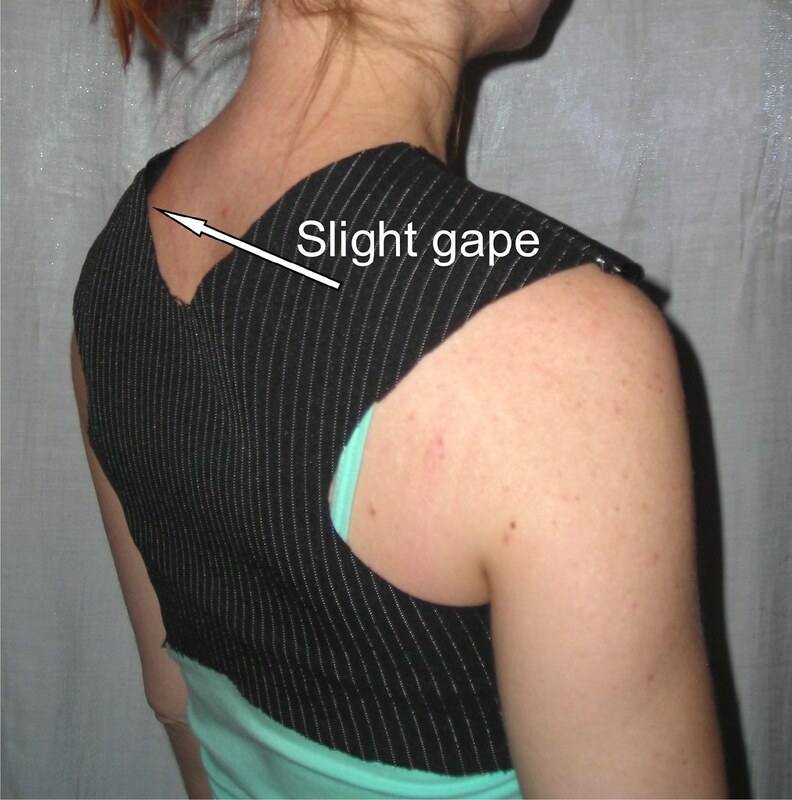 The front to back at shoulders and right side (zip will go on the left side). 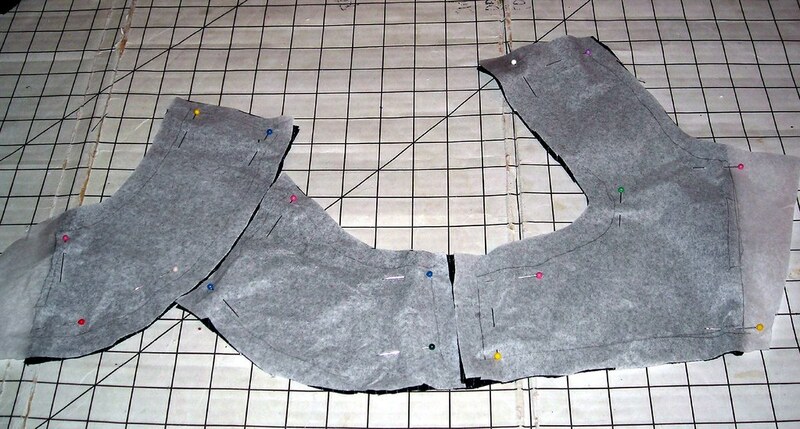 Then I'll assemble the facing (using the same three pattern pieces--front, side front, and back--as the outer), stitch them together all at once along the outer edge, sew the dress part on, and then hand-stitch the facing SA to the seam allowance of the facing/outer. 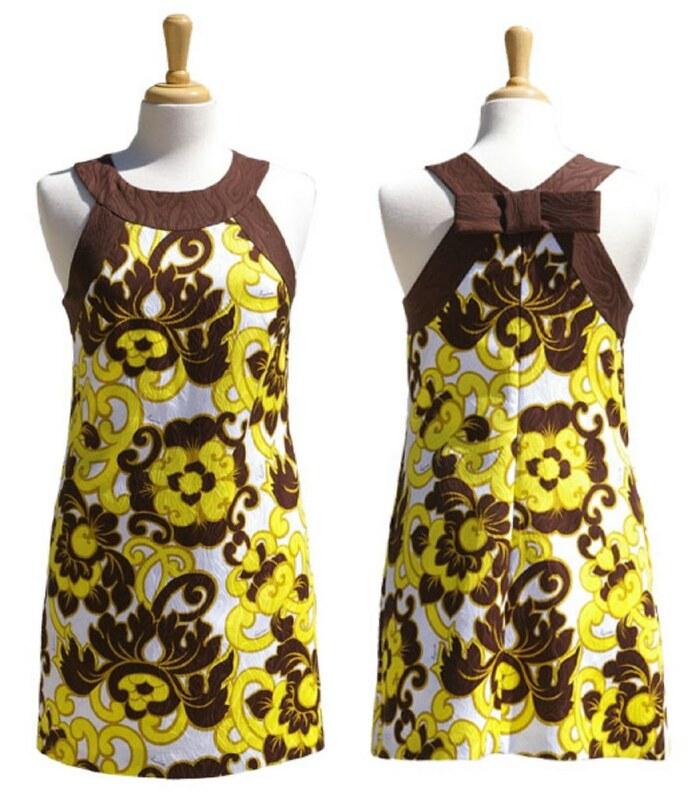 Saucy Seventies or Mod Maid? They used to make patterns for women 5'2"-5'3"? I was really born too late. 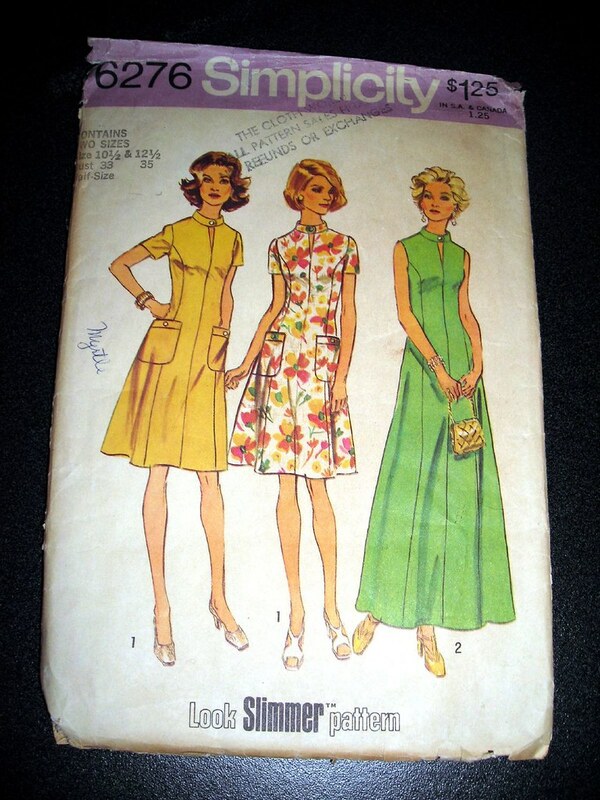 Anyway, I LOVED the giant pockets, and the keyhole neckline, and the princess seams, and everything about it really. I instantly saw it in black with polka dot contrasts. The polka dot fabric also came from Cidell. She spoils me, I tell you. I made it up this weekend and it caused me all sorts of quandaries. First, I wasn't sure whether to put sleeves on. In favor of sleeves is that it's black, it's (tropical weight) wool, and I envisioned it with sleeves. Against sleeves was that it's already warm here so I likely won't get to wear it until Fall, and I wanted this dress for my Paris wardrobe and it seems like Paris might be too warm for longish sleeves by the time I get there. I finally decided to go with the sleeves as planned and I think it was the right call. Except now I'm concerned about the pockets. I'm afraid they make it look like some sort of futuristic maid uniform from a 1950s sitcom. I didn't think of the hazards of black and white! So, what do you think? I'm leaning toward one low pocket, but in the photos it doesn't look as cute as it does in the mirror. The high pockets are the suggested placement. Their advantage is that they are tummy disguising in that position, but it looks the most like an apron/maid uniform that way. It actually might look the best with no pockets, but is that any fun at all? Hmmm. It's troubling me. I'd like to get this project done. Help? Last Saturday was Fashion Sewing Club at G Street. I didn't make it in March because I was having a tour of the White House courtesy of a friend who works there, and I'll be in Paris for the May meeting (what a life I do lead! it sounds so exciting when I write it down) so I was happy to make this one. We talked about elastic and shared recent projects and just generally had our fun time. I had an excuse for checking out the fabrics on the $2.97 table, because I needed something to coordinate with a knit print I got from Kashi at PR Weekend 2007. I love it but it's a little busy and the advice I was given when buying it was "not right up against the face." 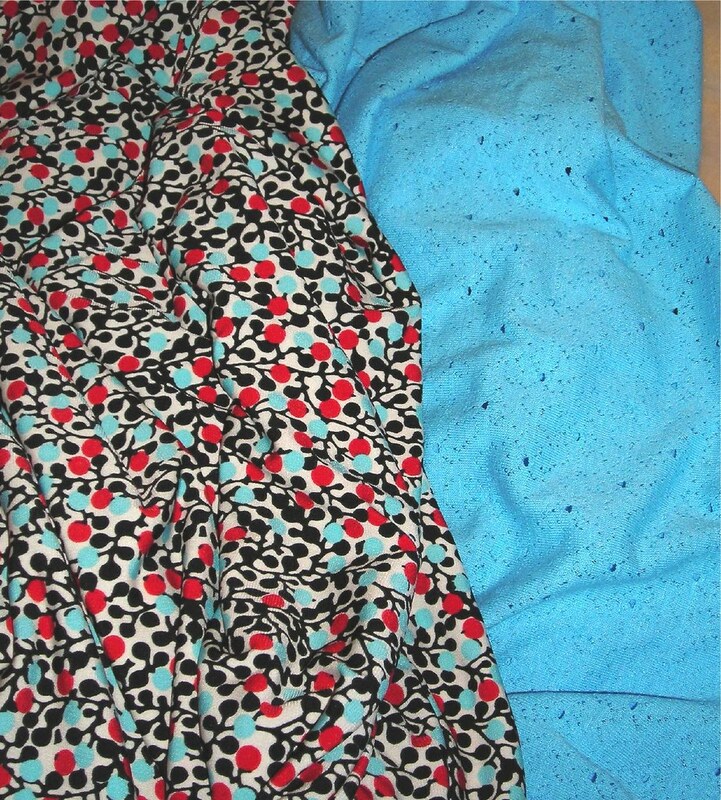 I did find a coordinating fabric, but two more somehow jumped into my arms. 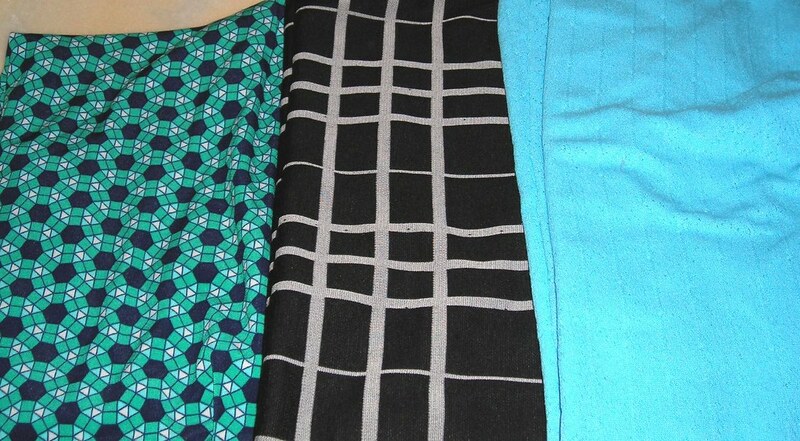 The green and navy print will go with a couple of navy skirts I have planned, and the black and white will be a nice basic knit tube/pencil skirt. You can never have too much black and white, right? I only got 1 yard of each, so I think I showed remarkable restraint. I was bummed about the idea of maybe having to grade it until I realized that Burda does this style top fairly often and sure enough, I found it in my size in August 2007, #105. It will be easy enough to translate the neck binding idea to the 8/07 pattern. 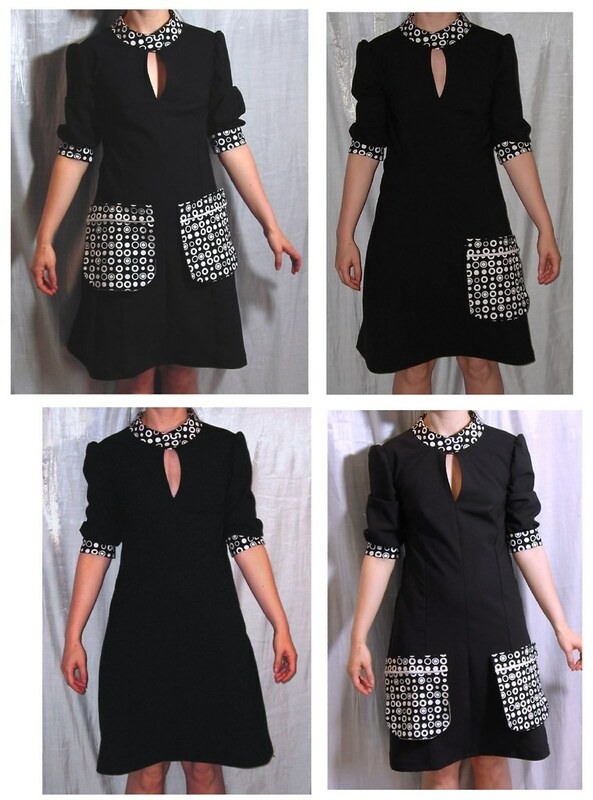 I even like the puffy sleeves of that version better, and will do the bottom sleeve binding in the contrast, and maybe also a contrast band at the hem (I'm liking this look in some boutiques I pass on my walk to/from work). Here's the Kashi fabric with the blue eyelet-ish knit. I was actually kind of hoping to find red rather than blue, but I have a weird relationship with red. I almost always love it...but I don't wear it that often. Blue, on the other hand, has been my staple since I was in high school. One of my close friends from college says that everyone with blue eyes is totally narcissistic because blue is always our favorite color. Ha! Maybe it's true, although my theory is that somehow the color of our iris affects the colors we see and blue is the most pleasing because of that. We're probably both wrong, but it's funny anyway. Let me know in the comments if you have blue eyes, is blue your favorite color? And if blue is your favorite color and you *don't* have blue eyes, leave that too. Or just leave your favorite color totally aside from your eye color. I love hearing people's favorites.